Mid-Morning Snacks for When You Need Something Sweet #infographic ~ Visualistan '+g+"
If your workday often starts with a sweet tooth craving, you’re not alone. 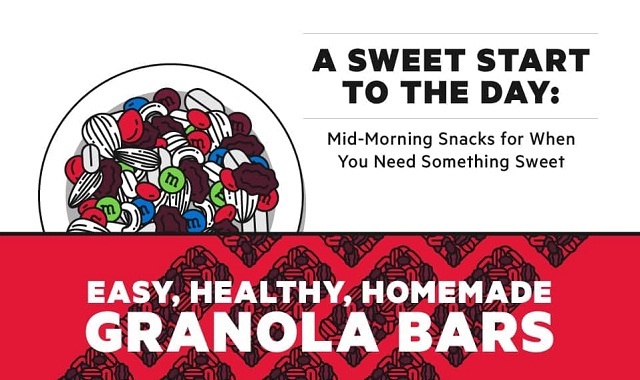 A recent survey by General Mills found working Americans like their morning to include a little something sweet. Whether made at home, delivered to the office, bought as part of a weekly grocery run, or picked up on the way to work, your sweet treat can take many forms. Just as there are premium savory snacks, meals, or craft beer, craft and artisanal snacks give sweet-tooth snackers a wider range of options than ever. While snacking on sweets all day every day may not be the most productive use of your time, studies show it’s smart to satisfy a craving before it becomes a never ending fixation. Many of the sweet items below can be whipped up at home. But if baking isn’t your thing, it’s easy to order online or find a version of these snacks at your favorite local shop or bakery or from your office snack supplier.